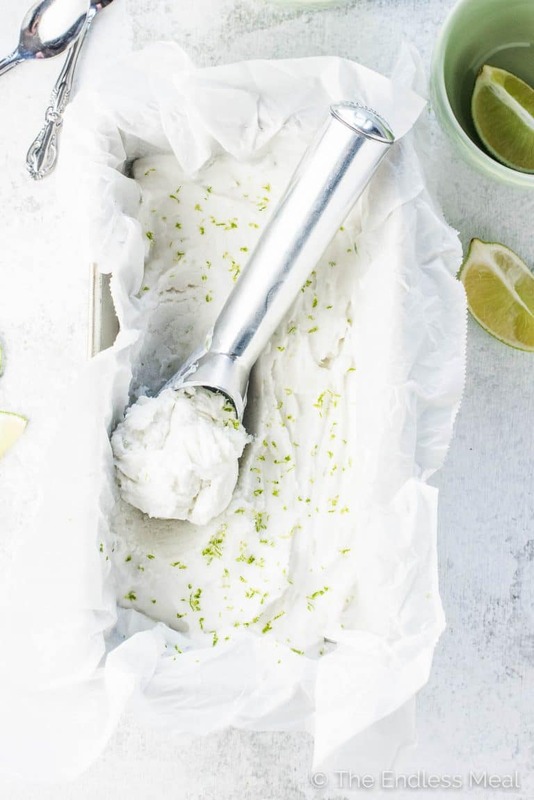 Lime Coconut Ice Cream is the ultimate healthy summer treat. 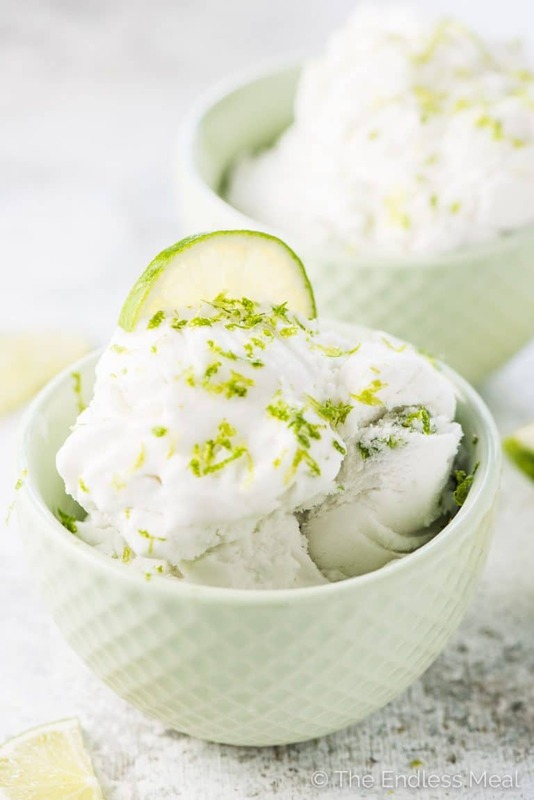 It's a super creamy, 3-ingredient, vegan ice cream that has just the right tartness from the lime. 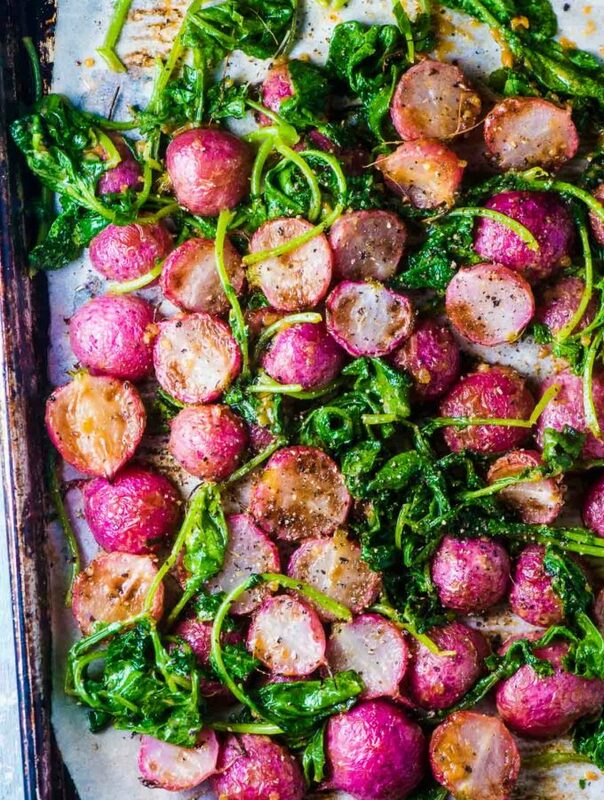 It's so easy to make and delicious that you'll want to make it all summer long! 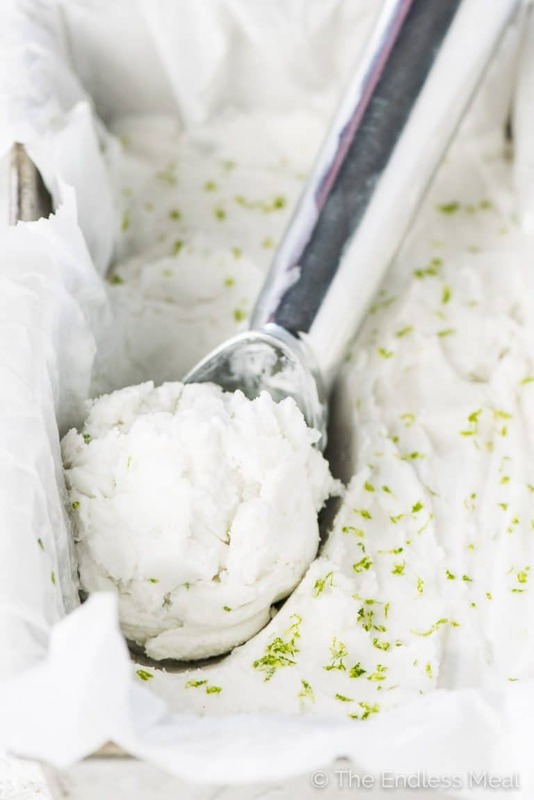 Lime Coconut Ice Cream is going on heavy repeat here this summer! This is all the good things wrapped up together in each bite. You're going to want a lot of it. 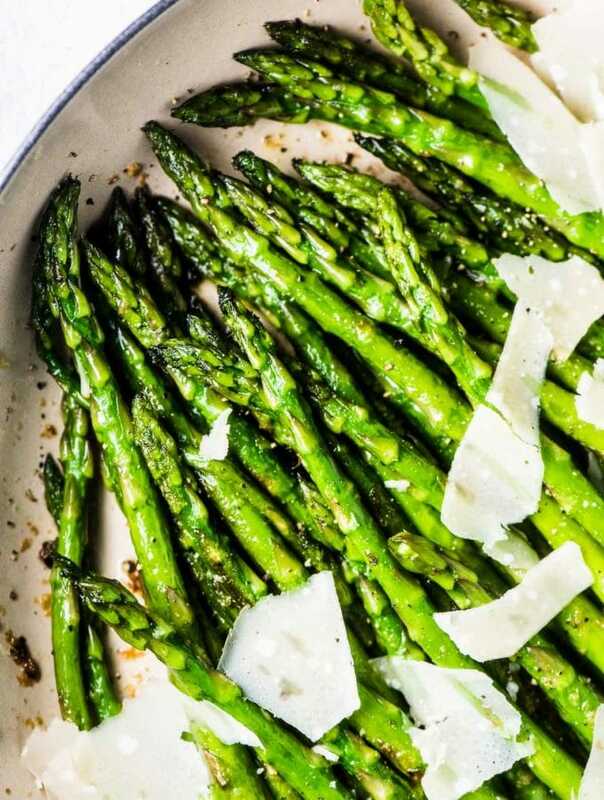 I originally shared this recipe with you back in 2012. (Give it up for the Throw Back Thursdays and the 33rd #tbt post on the blog.) Since that time, I've tweaked the recipe a bit so now it firmly stands in place as my favorite fruit-based ice cream recipe. Super creamy, luscious ice cream that makes you want to eat more and more and more. It's healthy, so you can eat more and more and more. Tangy lime tastes extra refreshing on a hot summer's day. It's ridiculously easy to make. You can use your ice cream maker OR opt for the no churn ice cream method. Your choice! It's dairy-free ice cream so you can feel good even after eating the entire batch to yourself. ?? This lime coconut ice cream doesn't taste anything like what I thought it would. I was going for a coconut sorbet with a hint of lime. What I got was the opposite, a lime sorbet with a hint of coconut. Not that I'm complaining, it's delicious. The bright flavor of the lime is kept perfectly in check by the creamy coconut. It's a flavor match made in heaven. This is all about summertime ice cream magic. Bring on the vegan ice cream! We've got a bit of a thing around here for dairy-free ice cream. 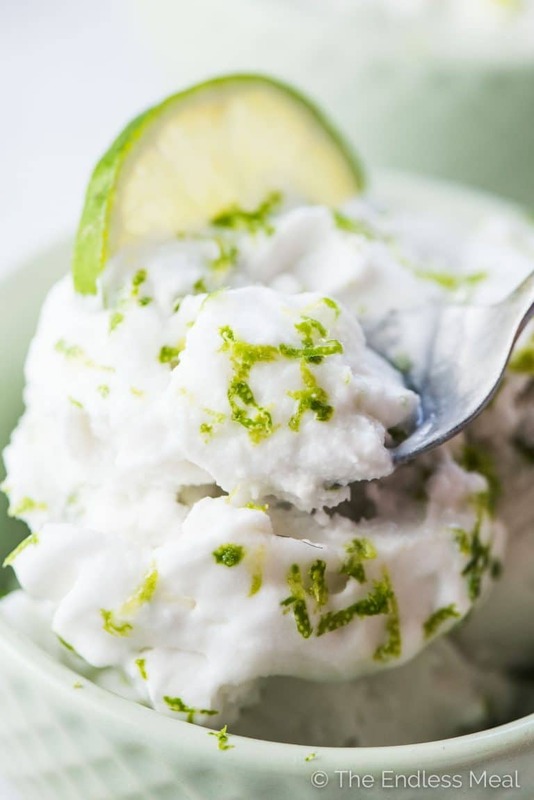 This lime coconut ice cream is the 9th vegan ice cream recipe on the blog. And with summer beginning, I guarantee it won't be the last. Even though I cook with more butter than I care to admit and sprinkle cheese on my pasta, when it comes to ice cream, dairy-free is the only way to go. Regular ice cream leaves me feeling pretty terrible. #truth! I love that I can eat a big bowl of vegan ice cream and feel great afterward. ? 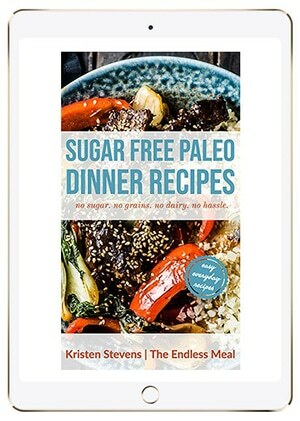 All of those recipes are vegan and most are paleo. Give it up for healthy, dairy-free ice cream! Whisk all the ingredients in a medium-sized bowl until the sugar has dissolved. 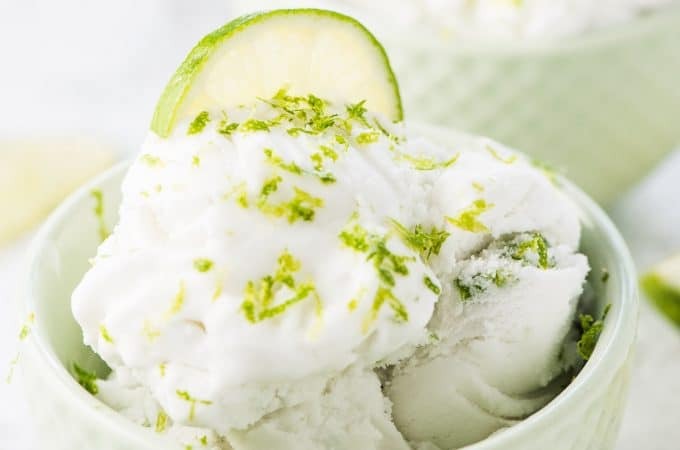 Pour the lime coconut cream into your ice cream maker and process according to the manufacturer's directions. Transfer the sorbet to a freezer-proof container and freeze until solid, about 2 hours. Use the highest fat coconut milk you can find. I like to use coconut cream, but a can of regular coconut milk will work, too. Try to use coconut cream or milk with no added ingredients for the best results. This is the best ice cream ever! I’m happy to hear you think so, too! I’ve never heard of coconut cream, but it looks like I need to go out and find some! You should totally look for it! If your store carries it, it will be next to the other cans of coconut milk. If they don’t, pick the can with the highest percentage of coconut. That will be the richest! I can’t believe you make this with only 3 ingredients 🙂 Looks so dreamy! Sometimes simple really is the best, isn’t it?!! This is such a refreshing and lovely treat! Ice cream is a serious weakness of mine. 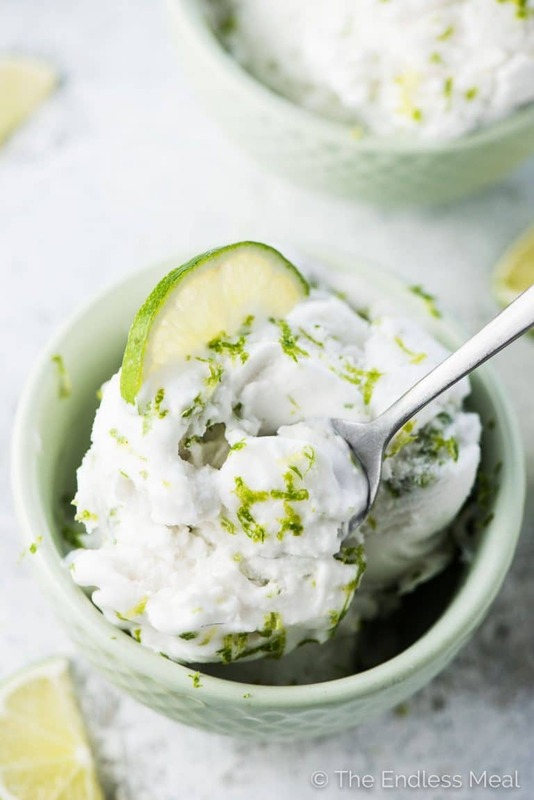 The coconut and the lime probably pair so perfectly–add a little graham crackers on top and you got key lime pie ice cream! Graham crackers on top? Girl, you’re amazing! So brilliant!! I make this but always add a pinch of salt. I serve it with grilled carmelized bananas and top it off with Thai Basil. It’s delicious and refreshing. I Just whipped this one up, and let’s just say it’ll be lucky to last until tomorrow. So with desert sorted, my better half is cooking up a hand made massaman curry for mains…. Could I use coconut cream for the recipe? I made this today and it’s excellent!! My son and I both love it just the way it is and my husband can’t wait to try it. I used low fat canned coconut milk and it still turned out creamy. Now I just need to find a good recipe for peanut butter ice cream. I can’t believe you just mentioned peanut butter ice cream. I have been searching the web all day to see if I can find a recipe I like! I wish you would specify canned coconut milk in your recipe. I just had to throw away a whole pot of curdled ingredients. Did you use fresh coconut milk? I never even thought of that possibility since fresh coconuts are almost impossible to get here. I’m sorry it didn’t turn out for you because of that. Thank you though for letting me know, I do really appreciate it. I’m going to add that into the recipe so other readers won’t make the same mistake. 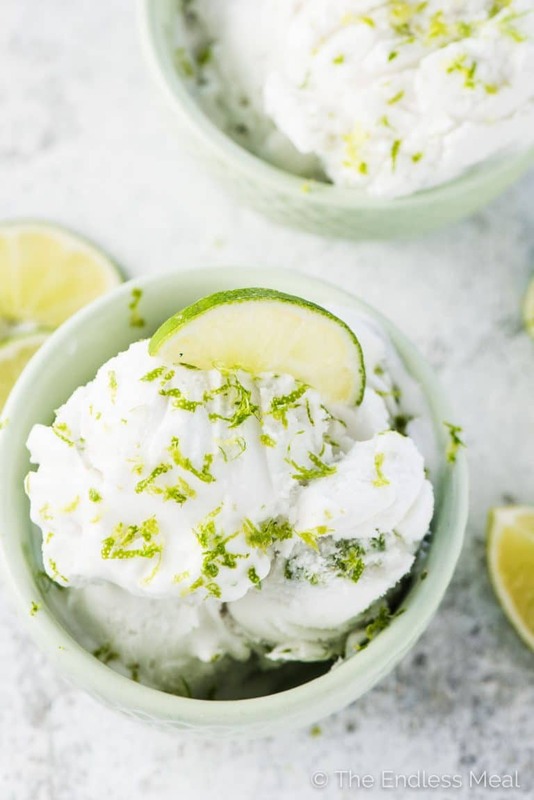 I’ve been slightly obsessed with coconut-lime anything for awhile now, and this seems to fit the bill! Can’t wait to try it! They have taken your great pictures of lime coconut sorbet and are passing it off as their own. It’s not the first time they have done this with other bloggers, including myself. Thank you so much, Steven for bringing that to my attention. I had contacted them and am now waiting for a reply. I really appreciate you letting me know! Is there any way to make this withOUT an ice cream maker? Because I don’t have one and this isn’t the first time I’ve been bummed that I don’t. 🙁 This looks and sounds delicious!! I’ve definitely read on the internet that it is possible to make ice cream without an ice cream maker. I think the trick is to freeze it for a little while (30-45 minutes) then take it out and whisk it well, then continue that process till it is completely frozen. Hope this helps! I just whipped this up… I am a huge coconut fan.. and a hint of lime is what I’d prefer, so I juiced 1/2 of a lime and put the zest of 1/2 a lime in. Let’s see if that helps 🙂 I’ll use the ice cream machine tonight and let you know if it resulted in a coconut lime instead of lime coconut sorbet! Definitely let me know how it turned out! It came out coconutty with a hint of lime… 🙂 Nice…. That’s fantastic! You’ve convinced me to try this recipe again, only with your alterations 🙂 Thank you! I don’t remember what kind of coconut milk I used but that didn’t happen to me. Try straining it through a fine sieve to remove the curdled bits. When I make a custard type ice cream I alway do this and it works well to remove any clumps. I hope that helps!! You have to use canned coconut milk, not the beverage type. The higher the fat content of your coconut milk, the creamier your sorbet will be. I guess the recipe wasn’t clear enough, it was canned coconut milk that was used. You’re right, definitely want the creamy fat content for ice cream! I am definitely going to make this soon. I love the combination of coconut and lime. It’s already crazy hot here in Texas, and this sounds so refreshing! Already pinned this one! Looks incredible! You’re totally right about accidents sometimes creating great things. And if not at least we can always learn from them 🙂 I’d be happy to share any leftovers with you and your DH! Love the concept of ice cream Sundays! In fact, I might have to go out and get some now, since I’m totally craving it and don’t have my ice cream maker frozen. Hope your next iteration of this is as coconut-y as you wanted!